In the maker community, it is something of a sport to make fun of the cheap tools found at Harbor Freight. While it is true that a lot of Harbor Freight products are on the cheaply-made side, if you’re careful, discriminating, and do your homework, you can get perfectly fine workbenches, storage tech, hand tools, and even some respectable shop machinery and equipment for hundreds less than higher-end brands. 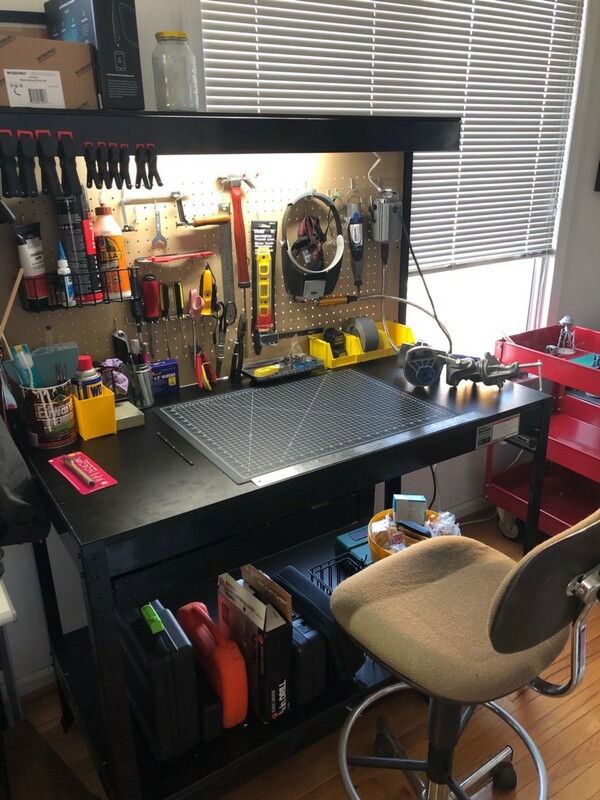 For starters, Harbor Freight workbenches, work carts, and storage systems are perfectly fine, especially for a home makerspace on a budget. I just bought their multipurpose sheet-steel workbench for $99. It’s got a lot of great features for the price: a pegboard, an LED bench light, a 3-outlet power strip, two drawers, and an under-bench storage shelf. It’s sturdy, handsome, and not as cheap-looking as you might expect for under $100. Of course, it comes flat-packed and requires hours of tedious fiddling with nuts, bolts, and washers to assemble. Figure: My $99 Harbor Freight workbench. I am thrilled with this addition to my shop. A friend of mine bought their $150 4-drawer wooden workbench and is similarly happy with it. I also bought one of their rolling metal 3-shelf service carts ($49). I am thrilled with both of these purchases. Their 30” rolling 5-drawer mechanic’s tool chests are also positively reviewed and can often be bought with a coupon for under $200. When someone asks me about what it would take to get started in woodworking, metalworking, mechanics, or whatever, I tell them: don’t be afraid to start off with Harbor Freight tools. You can always upgrade to better tools as you get more serious. There are many thoughtful reviews of Harbor Freight products on YouTube. Do a search on the type of tools you are interested in and “Harbor Freight” to find out more about a particular item and decide if the quality and price point are right for you.